I want to write a 3D modeling software since 2015, back to that time, I was trying to make a 2.5D MMORPG game. I self-learned blender for a while from youtube, the blender is quite good actually, however, the workload made me realized that it is impossible for one person to make tons of models, texture them, rigidify them, animate them, then use them in game, because built a simple dinosaur model took me half day. I watched lots of tutorials about how to quickly make a game ready model, tried to figure out a unified way, a repeatable mode, which can be simplified in programming language. I summarized most usual steps of making a model: firstly, setup a turnaround reference sheet for front view, side view, and back view, secondly, make a plane then subdivide to hexagon, extrude this hexagon by following the reference sheet, adjust the size of the face, fine-tune in different angle, back and forth, finally get the base model. Looks like I can write a software to automatically do these steps for me, I fed it reference sheet, it comes out a model. Let’s do it, I made a very rough test program, to recognize each view in the image, extract the boundaries, extrude faces according to the boundaries, it works if you zoom out the final result to a teeny tiny size. But it’s too small to be used in a game. 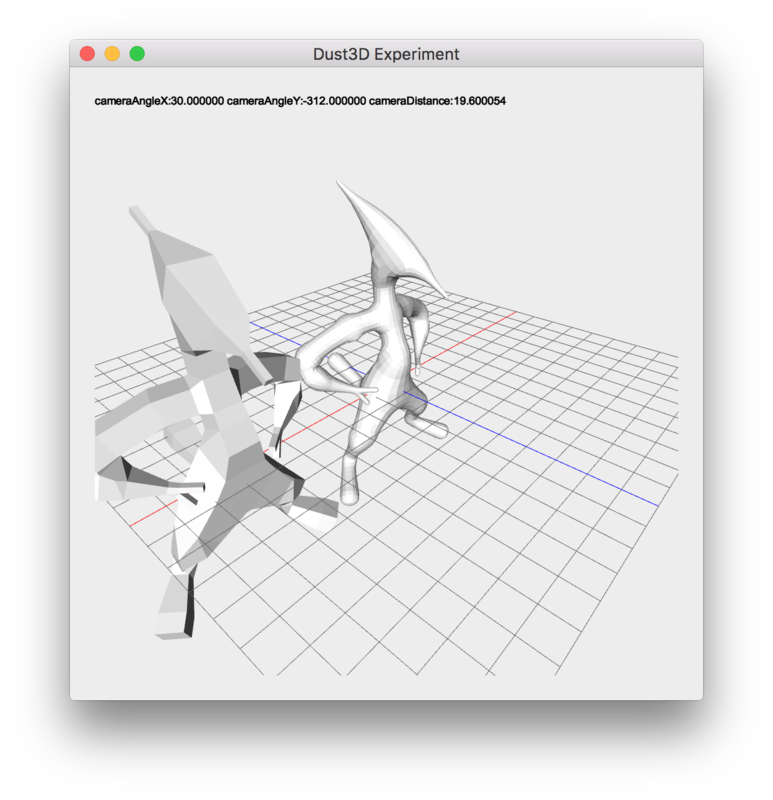 Some day, I googled some monster generation keywords, and found Jimmy Gunawan’s blog, I was shocked by his article, this is what I am looking for, this is the answer, I was very excited and when dug into the technonigies behind blender’s Skin Modifier which described in Jimmy’s blog, I found the paper: <B-Mesh: A Fast Modeling System for Base Meshes of 3D Articulated Shapes>, at that point, I thought it’s time to finalize the idea to a real working software. 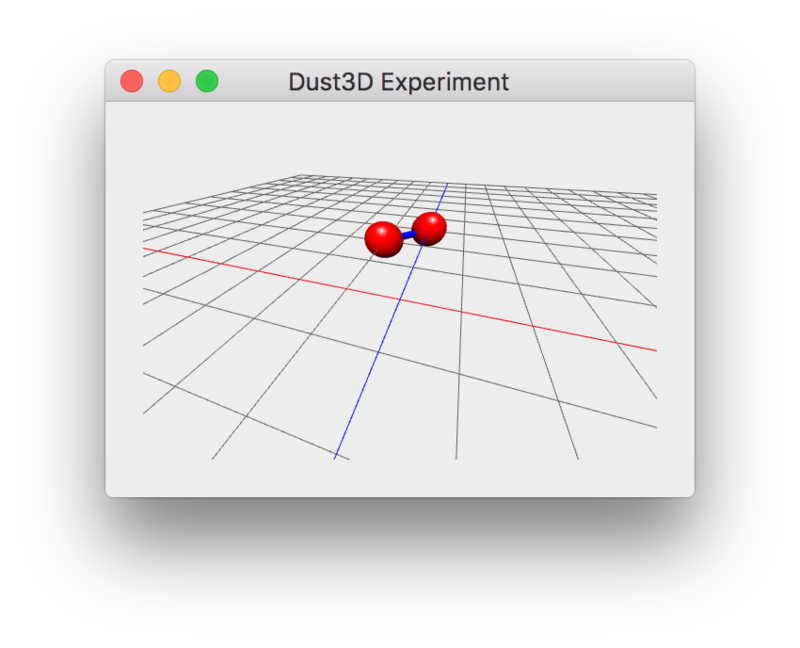 I launched the Dust3D project, and post my plan on reddit even I haven’t done much things. I did this because, as a newbie in game industry, I don’t want miss somethings in the very beginning. Thanks the amazing Redditors, I learned lots of new software names and modeling terms, such as Meshmixer, CGAL, and so on. Now, it’s time to make a more formal UI. You can see, the repository start from zero dependency, and then introduced some things inevitably. This way goes well if continues. But there is something happened. Because of no complex UI, I use blender to build the relationships of Bmesh balls, and I found a bug of blender in the Callada exporter, I tried to fix it by myself, so I downloaded blender source, fix it then submitted a patch. 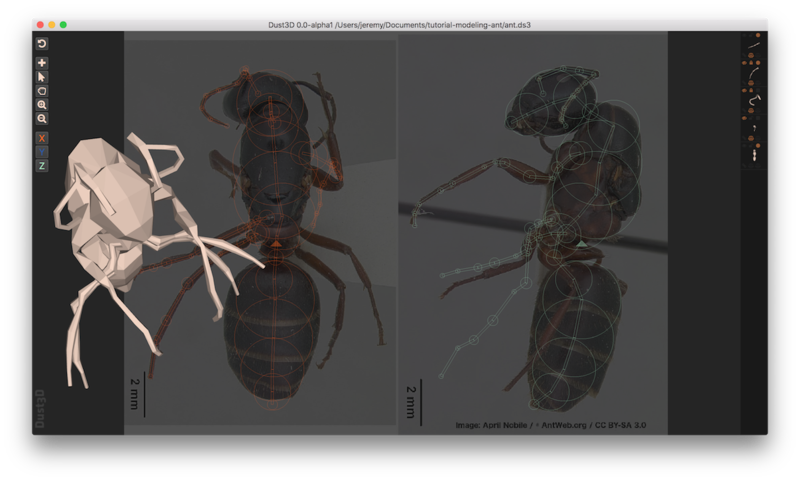 In this progress, I was sick of different C++ version problems, So I decided to remove all the C++ code from my Dust3D codebase. 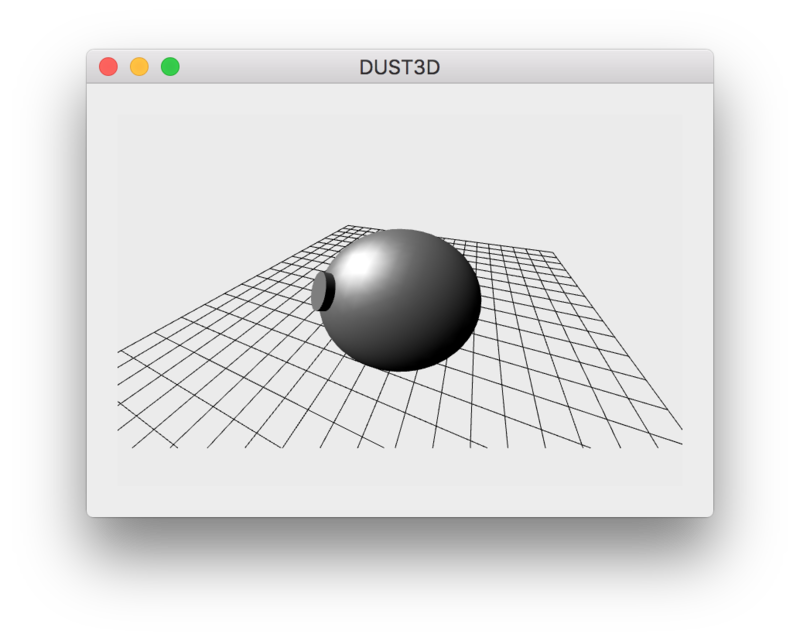 I started Dust3D project in Australia when I was on a work and holiday visa. There are lots of things stopped me from coding on this project, it’s quite busy. This made me to rethink the decisions I made. 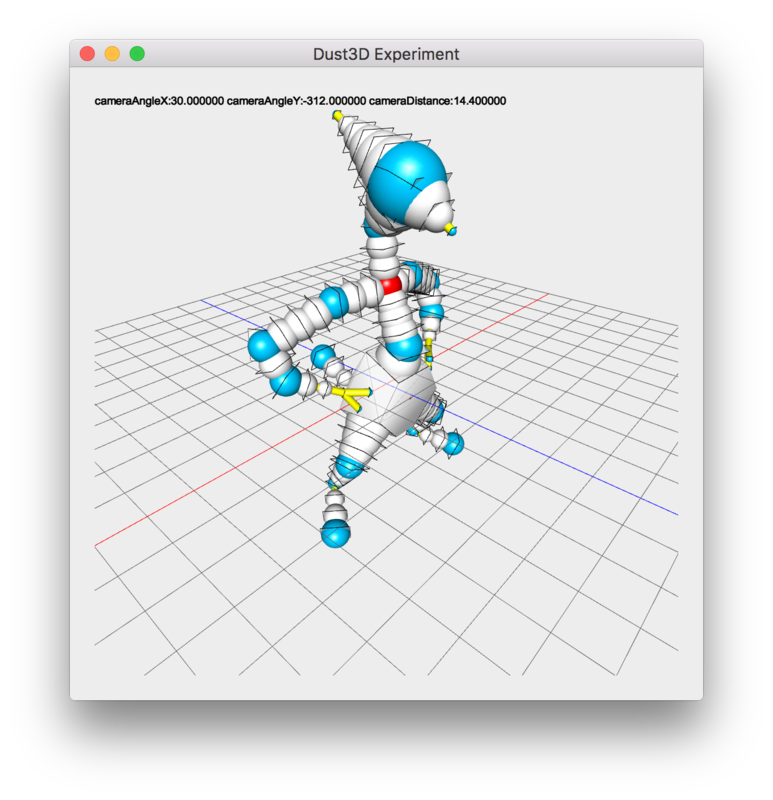 Remove all the dependencies are not good, I am making a 3D modeling software, not a GUI library. I also started to think about some details of the modeling progress. In the Bmesh paper, the author expressed some limitations that it is not suitable for making sharp edges. We all known, when we make a model for game, inevitably, there will be a cloth something, definitely makes some sharp shapes. I created a new branch named poc to do the proof of concept. Not by exactly implementing the node based modeling, I tried to define a new modeling script language, it can be easily embed in command line. At that time, I built many fundamental mesh operating algorithms, such as chamfer a mesh, mesh booleans. I can’t remember the exact reason, maybe the project name? anyway, I was distracted by the rust language. I tried rewrite all the fundamental mesh algorithms in Rust to practice the language skills. This is how the meshlite library came out. Now, I had far much better understanding of mesh, and know how to generate the mesh I want, no matter it is smooth or sharp. 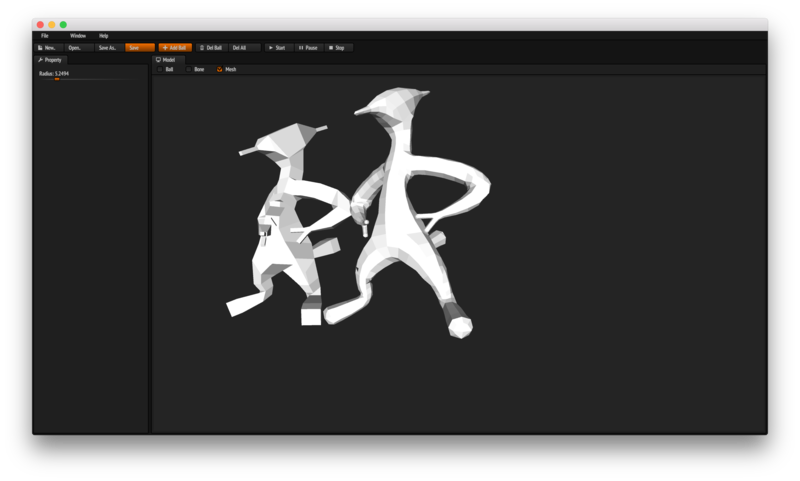 After finish the meshlite library, I tried to build the UI again. There are not so much choice of UI framework in the Rust world. And I did some investigation, and played many GUI solutions, such as bgfx, I even fixed a trivial issue of bgfx and got it merged. But finally, I still decided to use Qt. This time, the whole coding progress is very smooth, Qt for UI, Rust for algorithm, worked like a charm, and Rust never crash on right use case, what I mean by saying that, rust have some built-in difficulty to build a double-linked like data structure, so I need some unsafe code or index based system to support the multiple linked data, such as the famous half-edge structure in mesh processing, because the index based system are not protected by the Rust language, sometimes, it crashes on some logic error. I found I am happy with Rust and C++11 and the new Qt signal slots, I also happily introduced Carve and CGAL libraries to do the mesh union. Today, I decide to share my story, I have finished the stage one of Dust3D. It’s not perfect, but it is what I thought it should like in many years ago. This is what I want, this is the answer for my past years. Currently, there is no auto unwrap texture, no auto rigidify, no auto animation generated. There is a far way to go, and I am looking forward to it. Thanks for reading.